Foto’s van de Exploratie Pozo Azul 2011, gemaakt door het Nederlands team lid Peter Goossens. Afgelopen maand verscheen er weer een mooi artikel over de Exploratie Pozo Azul. Dit keer in het blad “Duiken” werderom een mooie verhaal geschreven door één van de Nederlandse team leden. 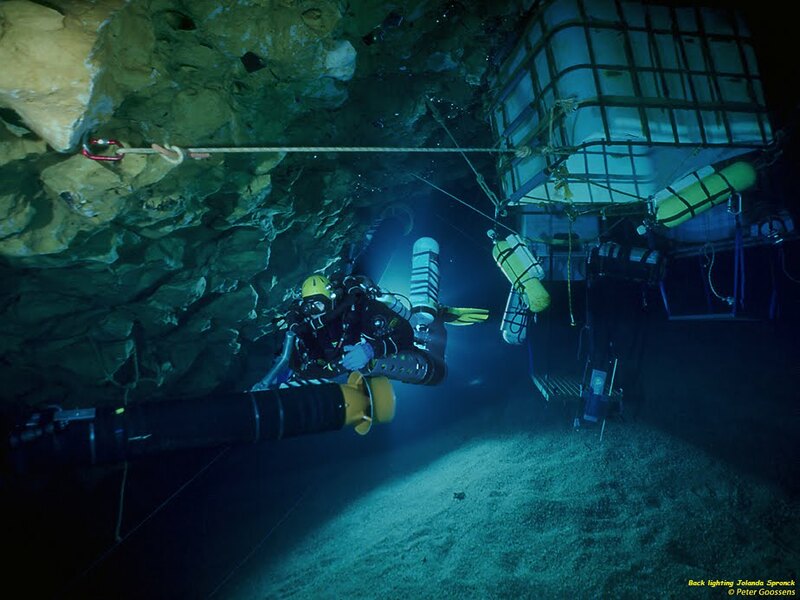 Wat zal 2012 het Dutch Exploration Team Pozo Azul brengen? Vrijdag 6 april zal de film URBAN SPELEO getoond worden in Aux Arcades te Maastricht! URBAN SPELEO is een film vol passie en sensatie over de exploratie van alles dat het daglicht van Parijs niet kan verdragen. 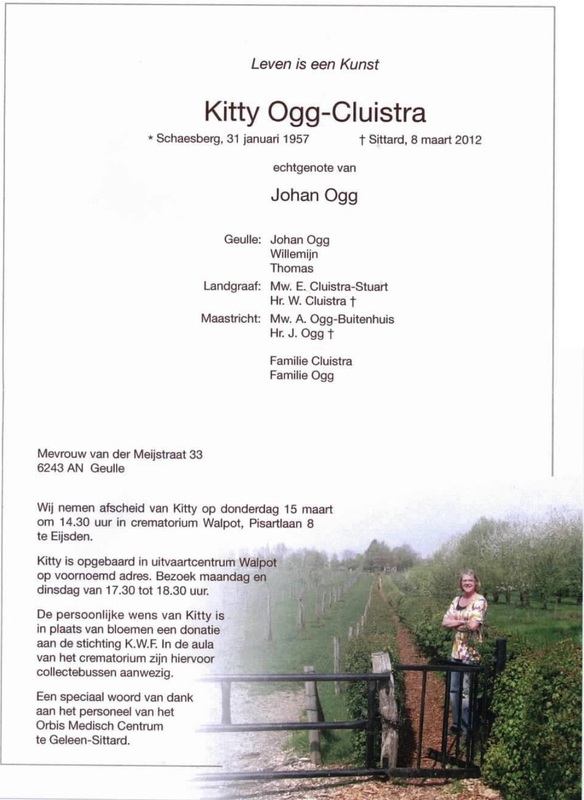 Gisteren ontvingen wij het treurige bericht dat Kitty Ogg-Cluistra is overleden, Kitty was jaren lang lid van Speleo Limburg periode 80-90. Namens Speleo Limburg wensen wij de familie en alle andere betrokkenen veel sterkte toe! 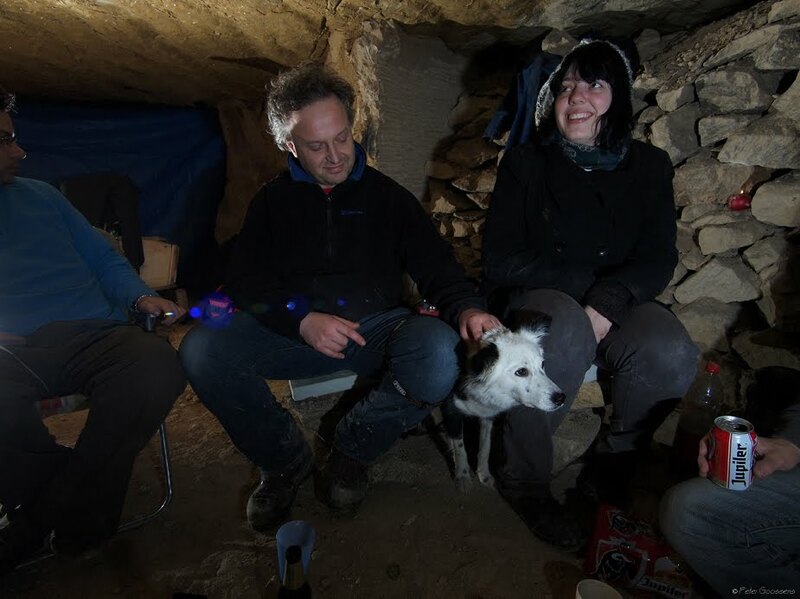 Avec Rodolphe le guide; Lenka la chienne, René; Harold; Peter; Jolanda. Why French? Well, first the trip was in France of course…and our guide is French. 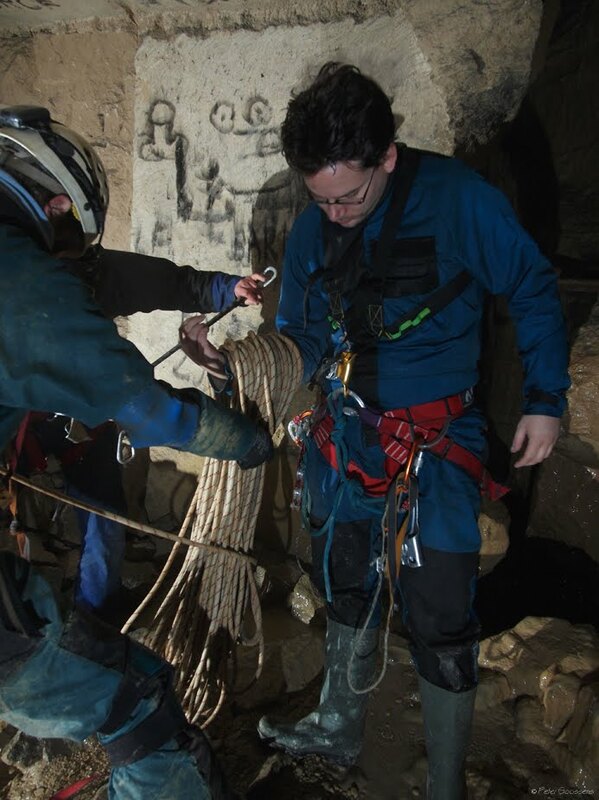 A while ago we met a few persons in the quarries of Maastricht, they asked us something about the quarry and I noticed one of them was wearing a caving suit. 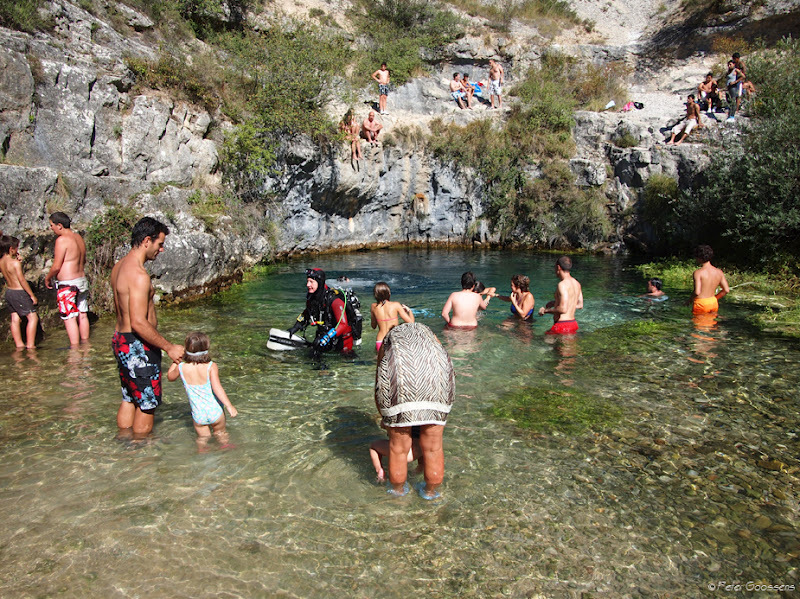 We decided to stay in touch because of the shared interests and later he joined us to some other quarries and to the Savonnieres for caving. 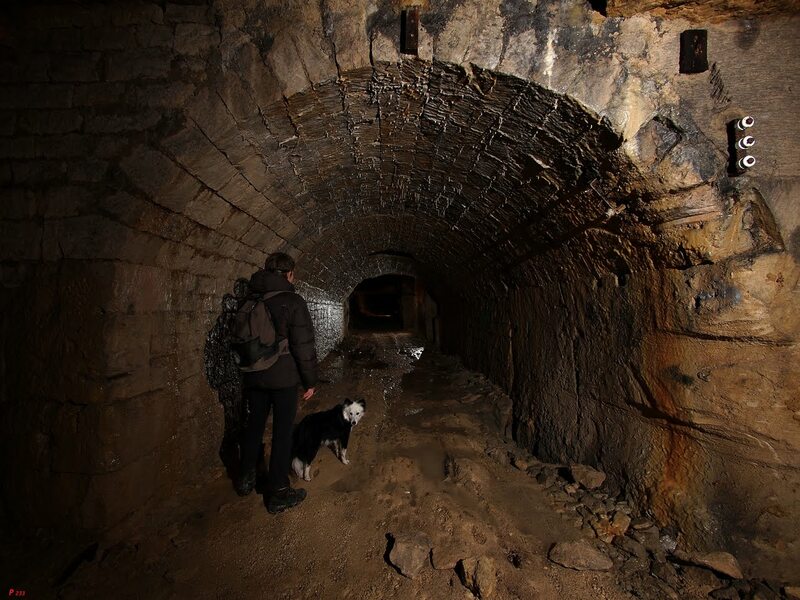 Since he was well known with the quarries underneath Paris, we decided to visit them together. The date was set on around carnival, since none of us was eager to celebrate this event. 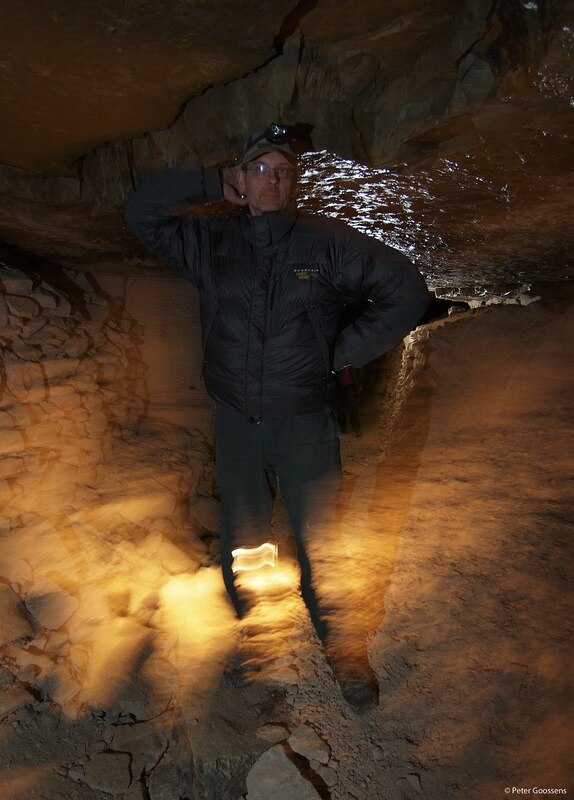 We had other plans: to spent 2 days in the quarries, with an underground bivouac. Preparations were made, some had to buy some necessary equipment, bags were packed-unpacked-repacked to fit every necessary detail and get rid of unnecessary things. Light travelling was the slogan, since we had to walk for hours and in case of meeting police, running away was the only option (apart from being caught, getting a fine and having to leave the quarry). So very early on Tuesday morning we drove to Paris and looked for a free parking place in a suburb. We found one on top of a supermarket, a parking that was free and hopefully safe. 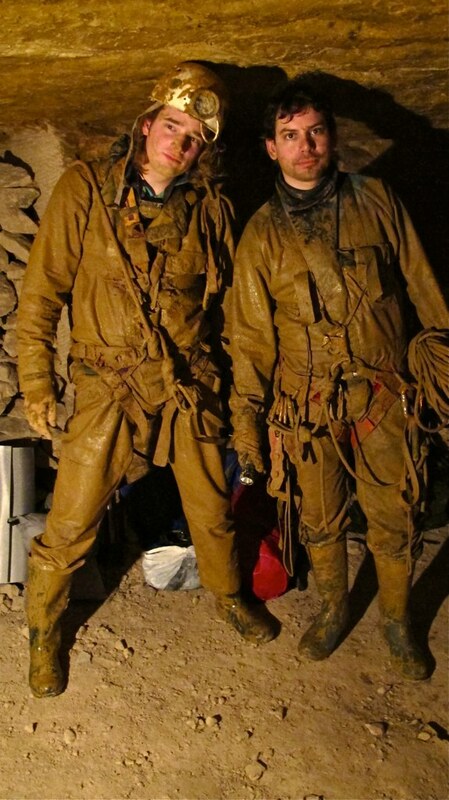 We left in our caving suits with heavy bags, walking through the streets to the train station. It appeared that Parisians are used to see all kinds of strange people, nobody really looked surprised..
We took the train and after that the metro north in the direction of the centre of Paris. There we walked the streets again while Rodolphe was looking for the right place to disappear in the underground. 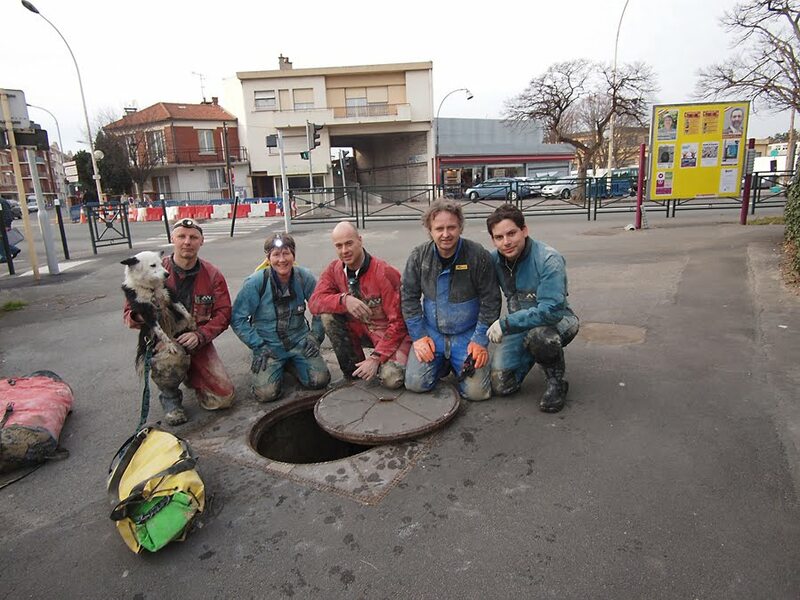 We lifted a lid in the sidewalk and descended about 7 metres along a ladder. 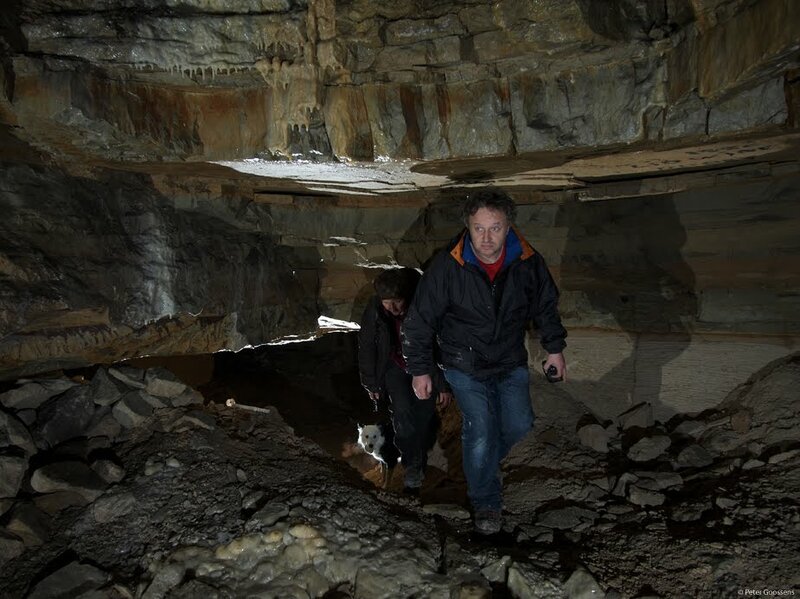 Than we walked a bit down a concrete gallery, and found a small opening into the quarry. We didn’t know wether all of us would fit this opening, a real etroiture. Harolds bag already was a close encounter and when it was his turn René had to help a bit by pulling his legs (“zieh mich xan de bein”). Once we were in, a long walk started along the galleries. And if anyone thinks this was an easy walk….We all carried a bag witch was very heavy during the first day: sleeping bag, mattress, 3,5 litres of water each, bread and cheese for 2x lunch and 1x breakfast, chocolate, nuts, 1 litre of schrobbeler (! ), first aid kit, dry socks and thin thermal underwear for the evening, food for Lenka, one of us had the gas stove and kettles, others carried soup, already cooked (to save water) pasta for 5 persons and 3 litres of pastasauce, candles, extra batteries, photogear, etc etc. Luckily the second day some of the weight had been eaten! With this heavy bags, we had to walk, crawl through so called chatieres (or etroitures), climb up and down stairways, walk with a bended head (for René almost all the time), a bended back, take the bag off because of the low gallery and put it on the back again, only to take it off again the next minute…And according to Rodolphe this was the normal tour, there is also a so called “warrior tour”. 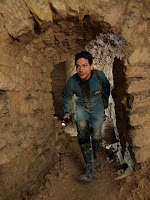 Sometimes there was water in the galleries, from 10 cm deep to waist deep. At those points we had to carry Lenka for a bit. Of course she can swim, but swimming a long gallery would take too long. Also she wouldn’t dry anymore, which was not a pleasant option since she had to sleep on our sleepingbags. We saw all kinds of different galleries, some just chopped out of the stone layer, and others were consolidated by brick walls. These consolidations started after the mining itself, when the city began to grow and got heavier and heavier. 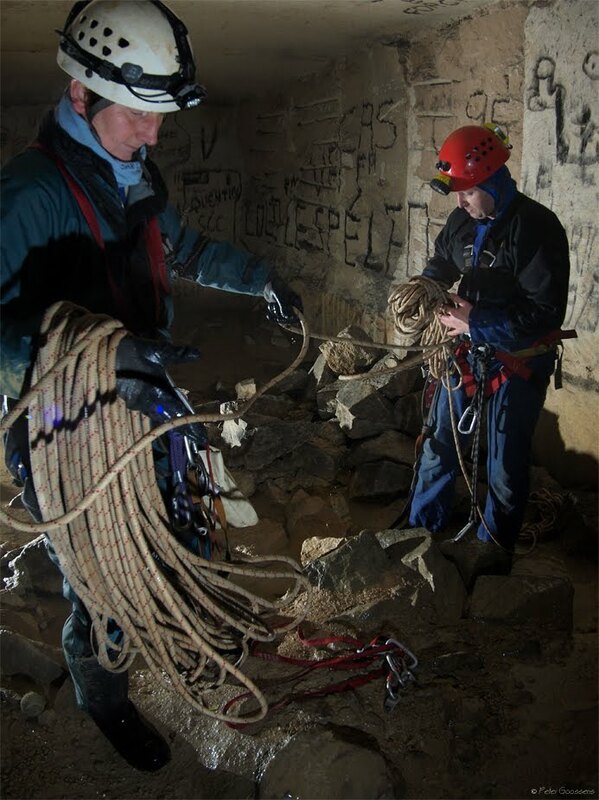 After quite some collapses it became necessary to consolidate the mines and the first inscriptions we saw ons these walls dated from 1777, this was when the fortifications started. Also around this period the Parisians decided to use some of the galleries as a cemetery. The cemeteries on the surface got fuller and fuller and it was necessary to make some room for the new dead…so part of the old graves were cleaned, the bones were put in the galleries and there was room again on the surface-cemeteries. 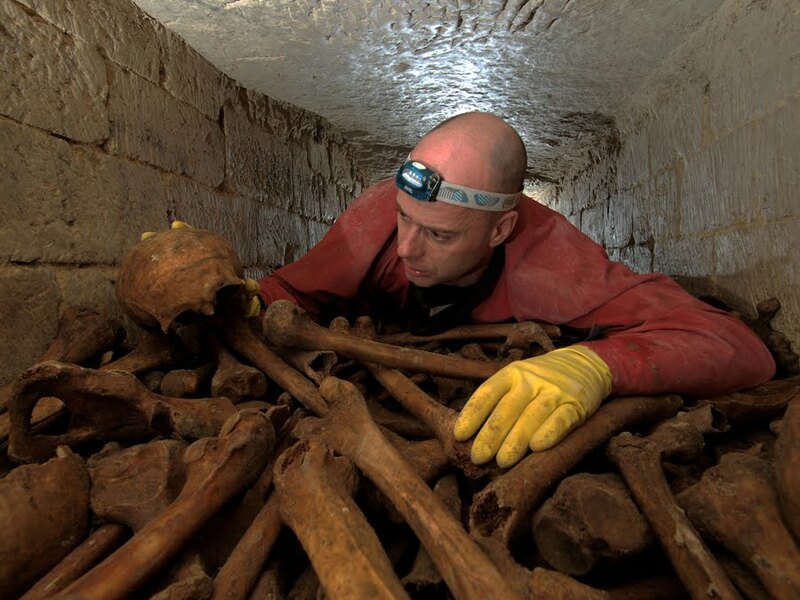 Also the galleries were used to burry the victims of the French Revolution, famous people such as Robespierre, Danton, Camille Desmoulins are actually resting in the catacombs, in middle of millions other unknown persons. 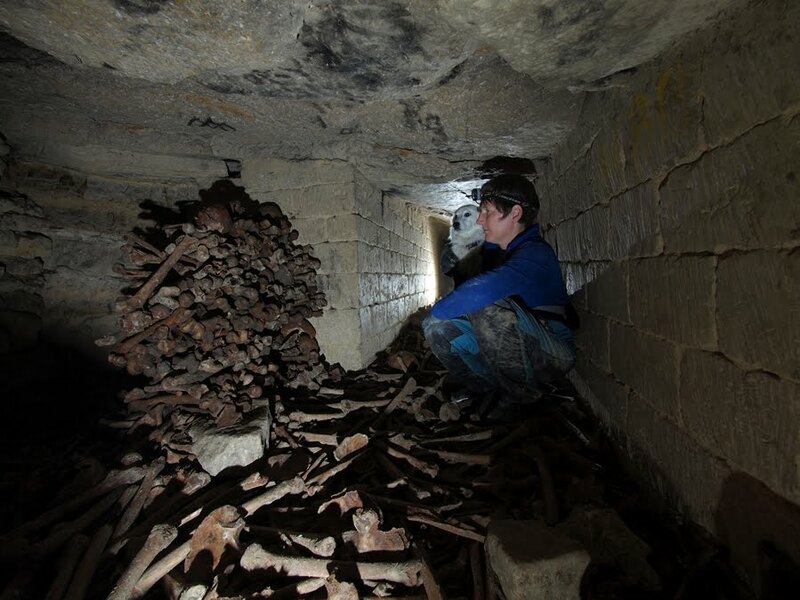 Although a lot of visitors in the quarries have felt the need to take some bones and spread them around or even take them up to the surface (maybe to put a skull on the chimney..) there are still loads of them. We took some photo’s but no one felt the need to go very far into this gallery. 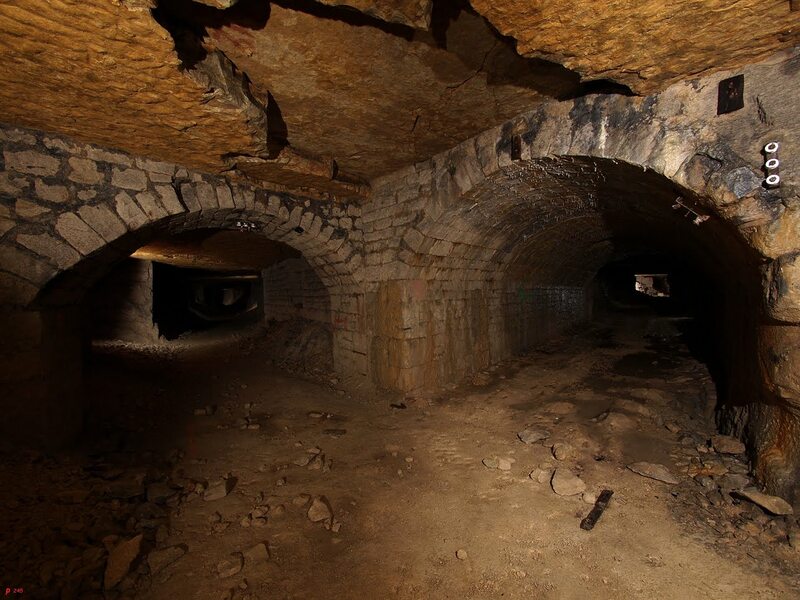 There were a lot of nice rooms, some of them restrooms for the old miners and others made by cataphiles (people who regularly visit the catacombes). Also there was a room with a fountain, La fontaine de Chartreuse. Beautiful, but very polluted at the time. 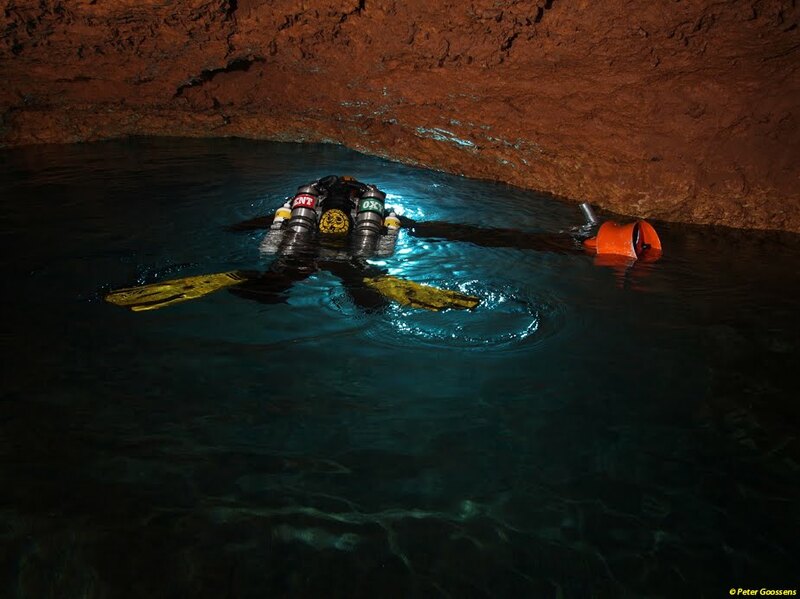 We saw quite some waterpitches, and knowing that there is also some cavediving going on in the catacombes, we always had a look into the nice clear water. 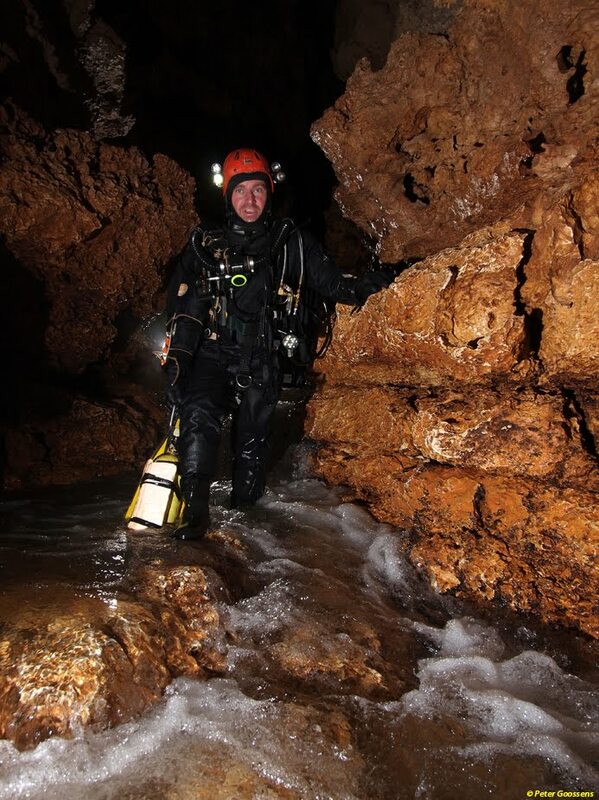 Cave diving was also one of the items of the evening talk in our bivouac. 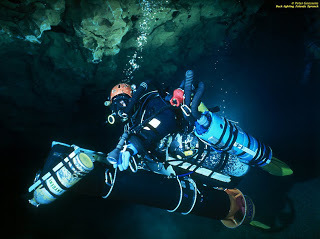 Rodolphe mentioned having done his initiation in diving, and wants to start cave diving too. 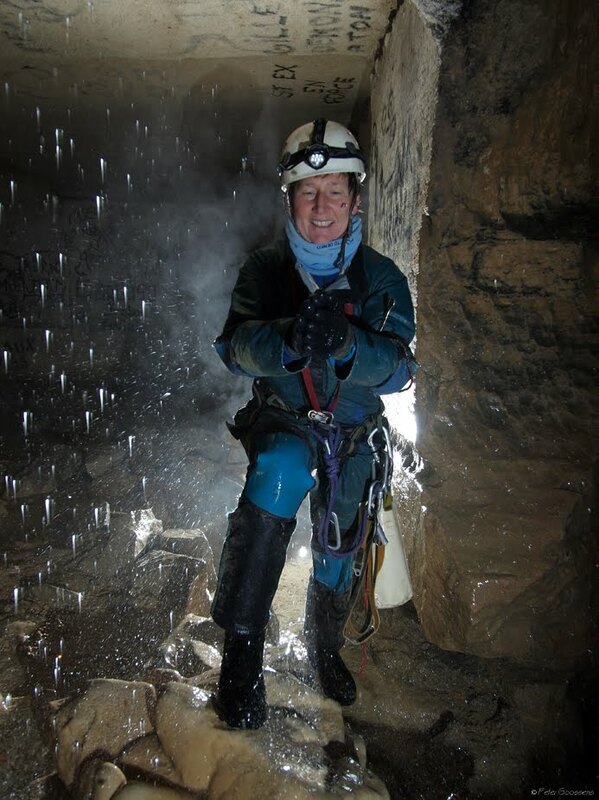 And being in the company of 3 cavedivers was enough reason to see what the possibilities are. 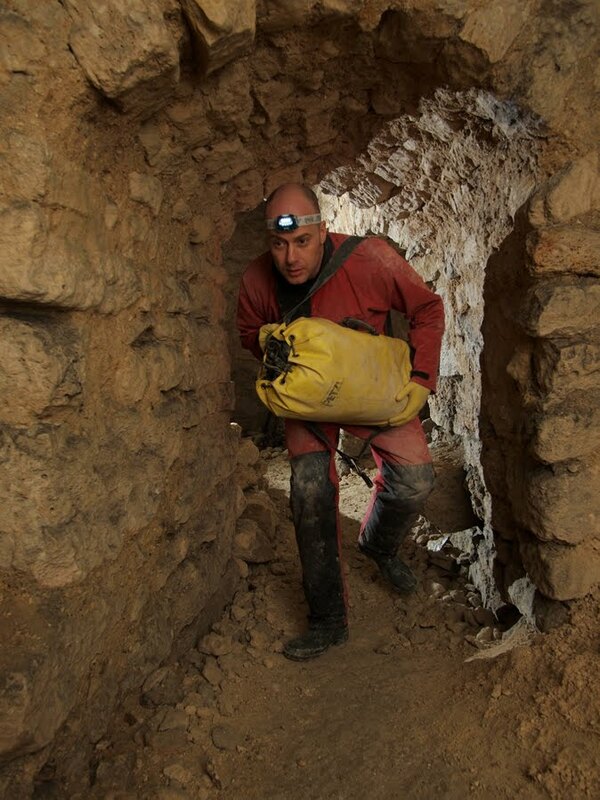 The bivouac was a nice room underneath a military hospital. It had a few small rooms, enough place to put our mattresses and sleeping bags and to do some cooking. The already home made pasta tasted good after this long day of driving to Paris, walking and crawling underground. And of course the “sjrubbelke” was a good digestive after dinner! The next day we went on south again, Rodolphe tried to get us mad by saying that we had to travel about 50 kilometres in total underground (nobody really believed him since this is quite impossible to do in this kind of environment with all the luggage). We passed another beautiful room, the cabinet mineralogique. In this room you see two stairways to the roof with steps of about 10 centimetres high. 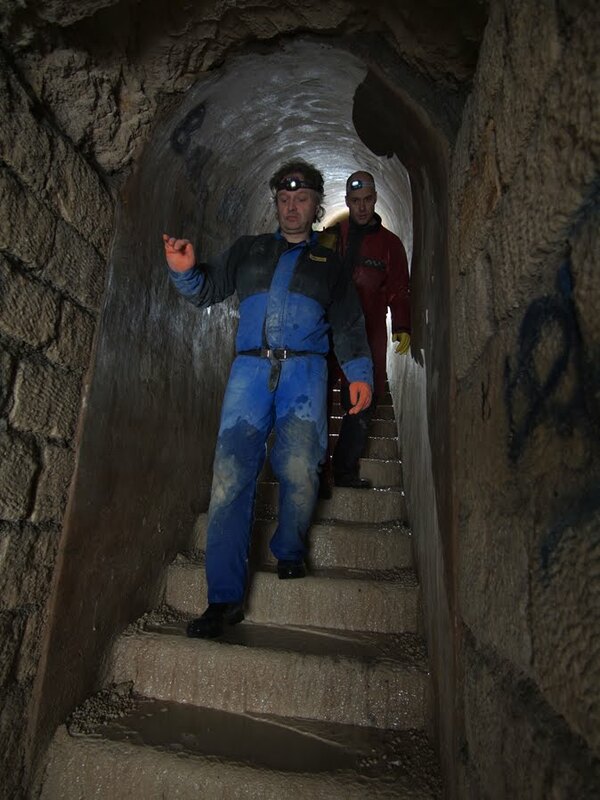 Each step stands for another layer in the rock and used to have a mineralogical example on it. On the wall you can still see the explanation of the different layers. A pitty that this room has also suffered from visitors who have no sense left in their heads, due to their alcohol and other abuse..
We also saw a nice sculpture, the passé-muraille. It is a man who comes walking through the wall, sadly also damaged by idiots. The underground passé-muraille is supposed to be sort of a copy of a likewise passé-muraille somewhere on the surface. 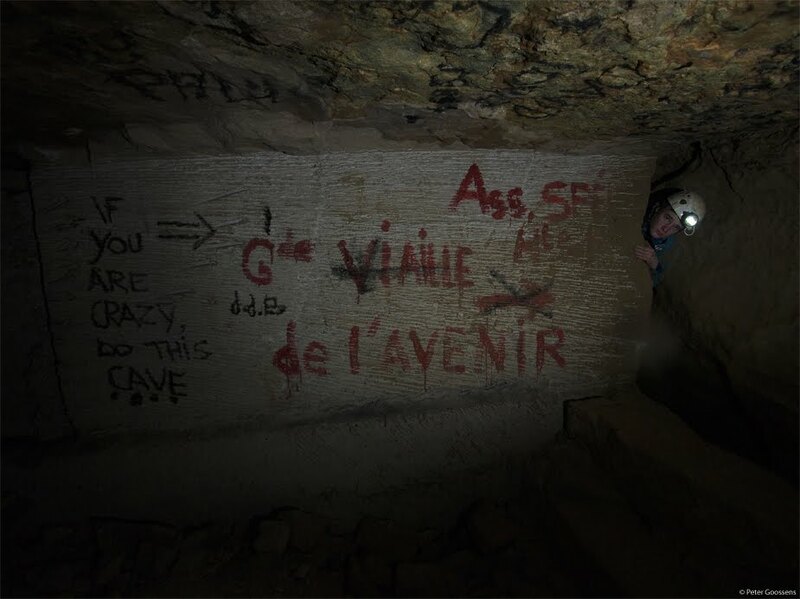 The quarries are full of graffity, the easier the way to get in somewhere, the more graffity around this place. Wherever there was an entrance for a while, you see lots of graffity and rubbish. The more remote places are nice and clean though and fun to walk through. The reason for the government to close the entrances is not to annoy people, but to try and make sure there are no incidents and accidents. There have been areas where huge parties took place, sometimes with a 1000 people. You can imagine what happens when these people start drinking etc. They get lost, fall down in pitches, get their hands between heavy lids etc etc. 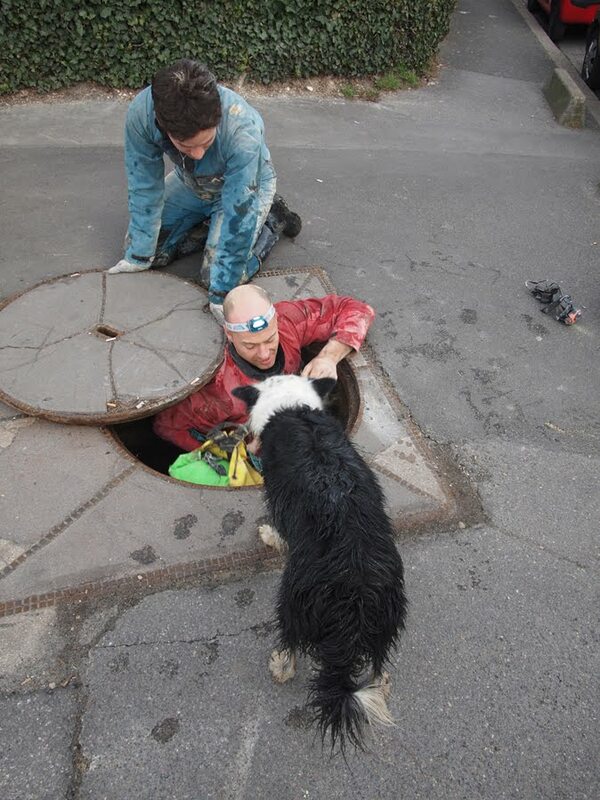 And everytime police and firemen have to start a rescue. At the end we also saw a nice form of graffity, a legal one. 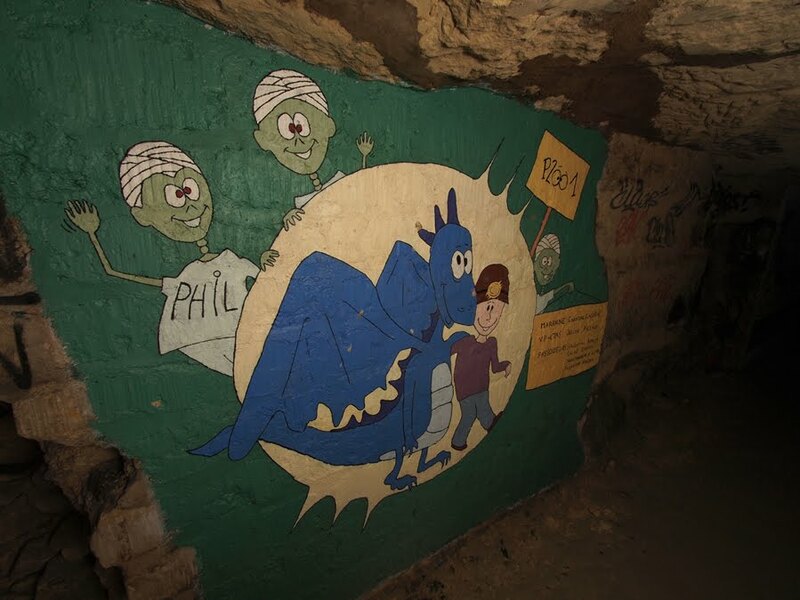 Students of an engineering school (Ecole Nationale Supérieure des Mines de Parisevery) get an annual license to enter the quarries for a certain amount of time, and every year they make one painting on the wall in a specific gallery. You can now see paintings of a few decades there. 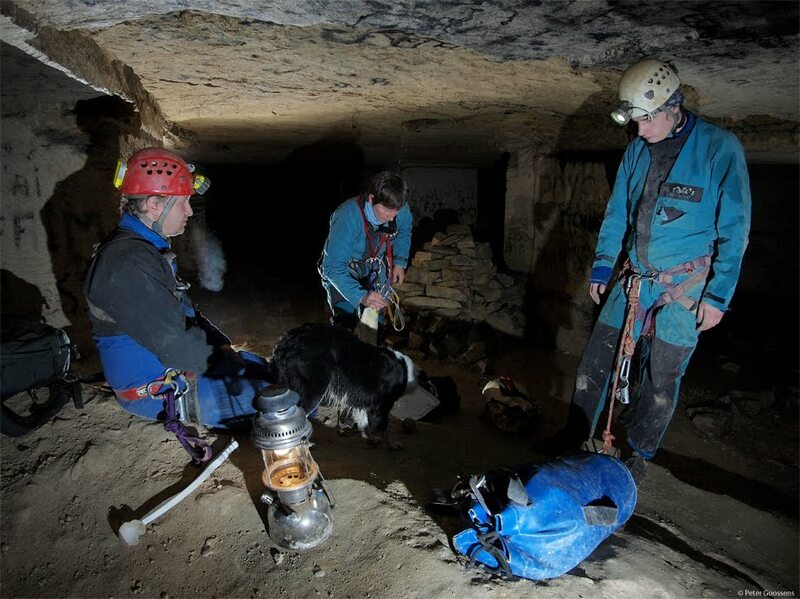 Finally, after more than 30 hours underground, not too much sleep, an aching back, some heads scratched against the ceiling, we arrived at a small ladder which led to a lid. It was supposed to be our exit and hopefully still open. If not we had to go on searching for one that was open. It was open, and so we all climbed into the daylight again. And again nobody passing by looked really surprised. An old man even was kind enough to make a picture of our group. 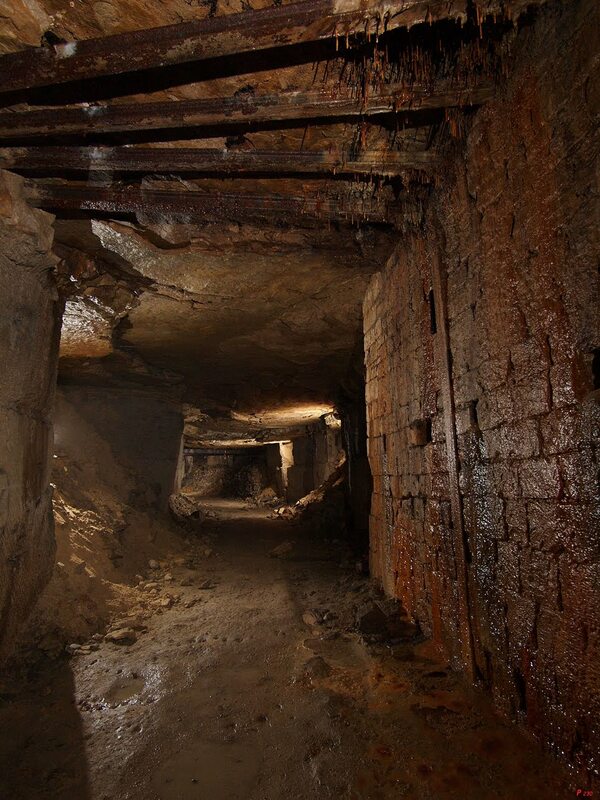 Next time we’ll visit one of the other Parisian quarries! Graag willen we jullie uitnodigen voor de ALV van 2012 die dit jaar op 31 maart wordt gehouden in recreatiepark Hommelheide te Susteren. svp voor 20 maart het geld overmaken ondervermelding van het aantal personen. Indien vegetarische maaltijd gewenst, dit ook aangeven. Duur van de rondleiding ca 2u incl. bezoek aan ondergrondse galerij. Wij hebben geboekt op zaterdag 3 maart om 10.30u, dus omstreeks 10.00u daar zijn. er wordt na 10.30u niet gewacht!!! Kerst ondergronds in de Savonnieres. 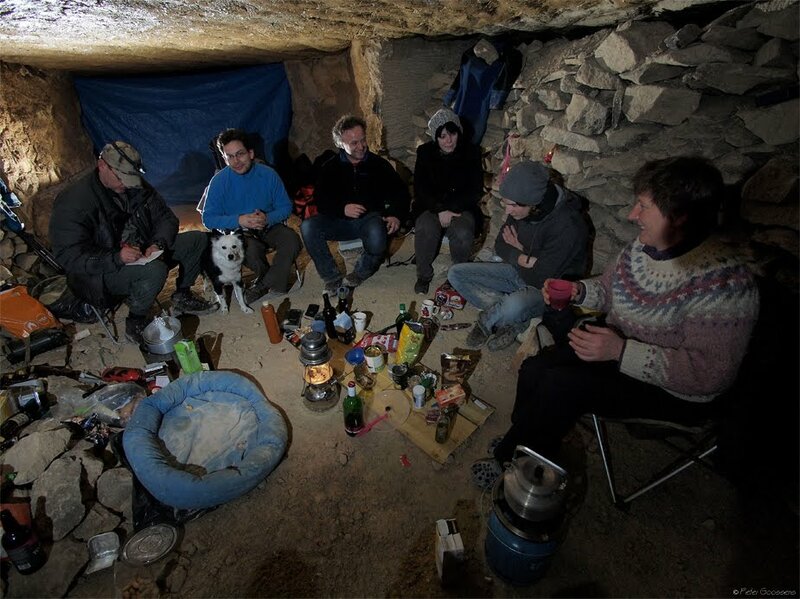 Een paar speleo’s, die echt geen zin hadden in een traditioneel kerstdiner, besloten de kerst volledig onder de grond te gaan doorbrengen in de mergelgroeve van Savonnieres en Perthois. Veel mensen kregen we niet mee, dus het groepje bleef beperkt of misschien is select een mooier woord. Harold van Ingen, Arend Theunissen, Frans Kampkes met vriendin Saranne, Peter Goossens en Jolanda Spronck en natuurlijk Lenka, pakten hun spullen bij mekaar. Tom Cox zou meegaan maar werd plots geveld door een hevige griep. Hij had wel nog inkopen gedaan voor de groep, waarvoor onze dank! Het selecte groepje werd op het laatste moment nog vergezeld door Rodolphe Garcimore, een fransman die Peter en Jolanda een week ervoor hadden leren kennen in een groeve en die daar in een speleopak rondliep. De link was snel gelegd en hij bleek wel interesse te hebben in iets meer speleo-achtigs. Leuk detail was dat hij dus Fransman is, helaas doof, wel Frans kan liplezen (leuk in een donkere groeve) en gelukkig ook Engels kan lezen en schrijven. 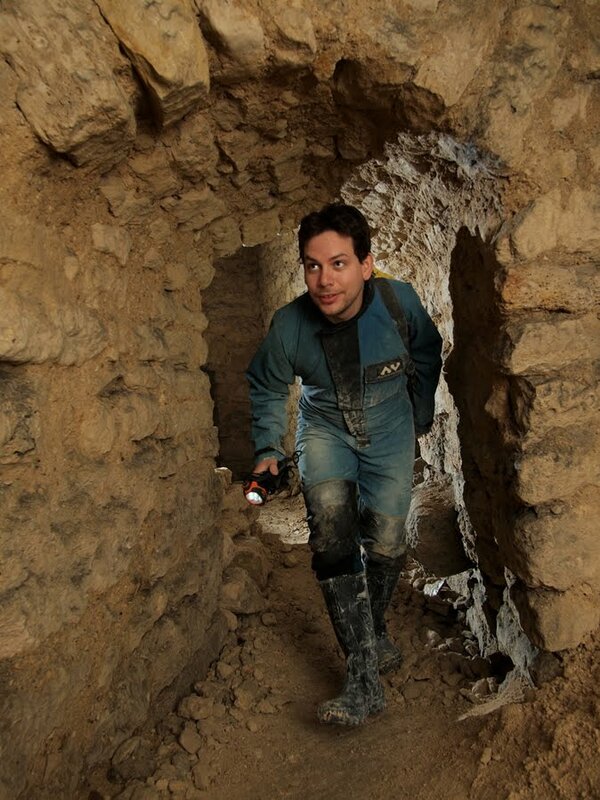 Het zou een uitdaging worden om met hem te grotten, des te meer omdat hij nog niet echt veel ervaring zou hebbben! Er ging een notitieboekje mee voor het geval het Frans niet zou lukken, Engels ligt de meesten van ons toch wat beter. Het begon goed, terwijl Peter, Jolanda, Frans en Saranne al op vrijdagmiddag aanreden en het kamp gingen inrichten, zouden Arend, Harold en Rodolphe later arriveren. Dit werd inderdaad later omdat de auto van Arend onderweg kuren kreeg en hij met een kapotte drukgroep nog maar net de groeve kon bereiken. Die eerste avond werden de plannen dus al een beetje omgegooid want er moest iets geregeld worden voor dat auto-probleem, een vervangende auto en afslepen van de kapotte. Arend besteedde dus het grootste gedeelte van het weekend aan naar buiten lopen, bellen en sms-en met de ANWB, op enig moment geholpen door Harold die effetjes genoeg had van de langzame voortgang aan de andere kant van de telefoon. Het notitieboekje vermeldt: “now that you have no car to go home, we have decided to come back next week and join you here again for new years eve. We will bring new beer and food. There will be enough food left for the 3 of you to survive next week”. In de tussentijd ging Frans de eerste put van de Sonnette uithangen, om daarna met Saranne wat te gaan wandelen. Jolanda zou de rest gaan uithangen, op de voet gevolgd door Rodolphe en Harold. ’s Avonds werd de grot geëvalueerd, onder het genot van rochefort, speciaal kerstbier (gringelbel), wijn, en Paella. Ook was de kapotte auto en de pechhulp een dankbaar onderwerp van gesprek: “they are now trying to think of a way to persuade the lady f the Assurance to bring a rental car tomorrow”. Er was altijd wel iemand stevig op z’n engels in het notitiboekje aan het pennen met Rodolphe over mogelijke toekomstige ondernemingen, over technieken, grotten in België en Frankrijk etc. En lenka bracht ook nog wat leven in de “brak” door telkens die ellendige tennisbal ergens bij iemand neer te leggen en dan op een afstandje te gaan aandacht trekken. Op de één of andere manier zag zij de nieuweling Rodolphe ook als een nieuw “slachtoffer”, overigens niet geheel tegen de zin van Rodolphe, die nota bene voor dierenarts studeert. De volgende dag was de doorsteeek Avenir-Vialle gepland, maar helaas moesten Peter, Harold en Arend 70 km verderop de vervangauto gaan ophalen. Rodolphe en Frans besloten nog een klein grotje te doen, de Chatiere. 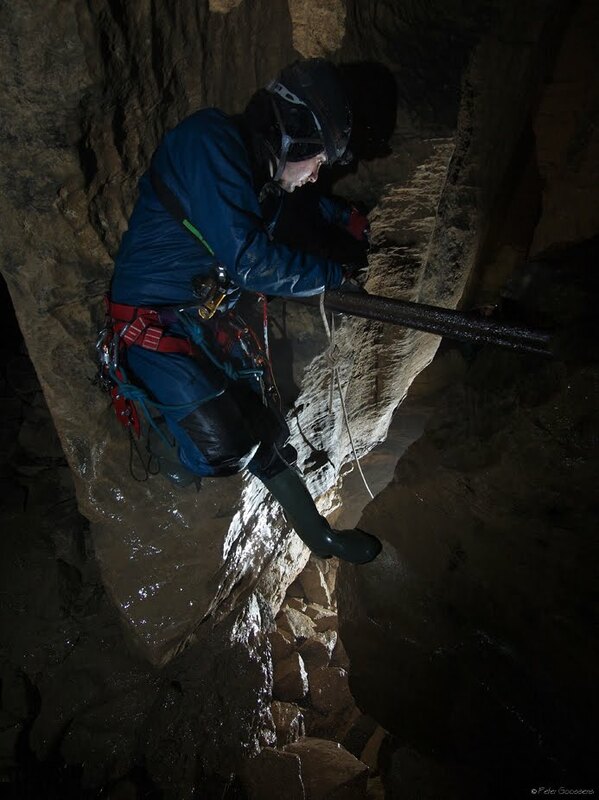 Deze grot was nog onbekend in ons groepje, het notitieboekje vermeldt: “Nobody of our group has ever done this cave. Don’t be too fast, I have a headache. What is in your bag, put it in my bag”. Duidelijk een voorbeeldige communicatie dus! Terwijl Frans het koord ging uithangen, kon Jolanda bovenaan nog even een kleine check doen bij Rodolphe en hup, daar waren beiden verdwenen door het Kattegat. De één godverend, de ander lachend, maar misschien was dit laatste nog wel voorafgegaan door binnensmonds Frans geratel. Later kwamen ze terug in het kamp, onherkenbaar geschminkt met een lekker bruin grottenmoddermasker. Het enigszins schoonmaken van de spullen kostte meer tijd dan de grot zelf! We hebben nog een korte wandeling annex fotoshoot gemaakt en helaas was het toen weer tijd om de boel in te pakken. 2 Dagen waren omgevlogen, helaas voor sommigen zonder grotten, maar wel heel gezellig. Achteraf werd er gemijmerd over terug naar de oorsprong en neanderthalers en meer van dat soort heerlijke nostalgie. 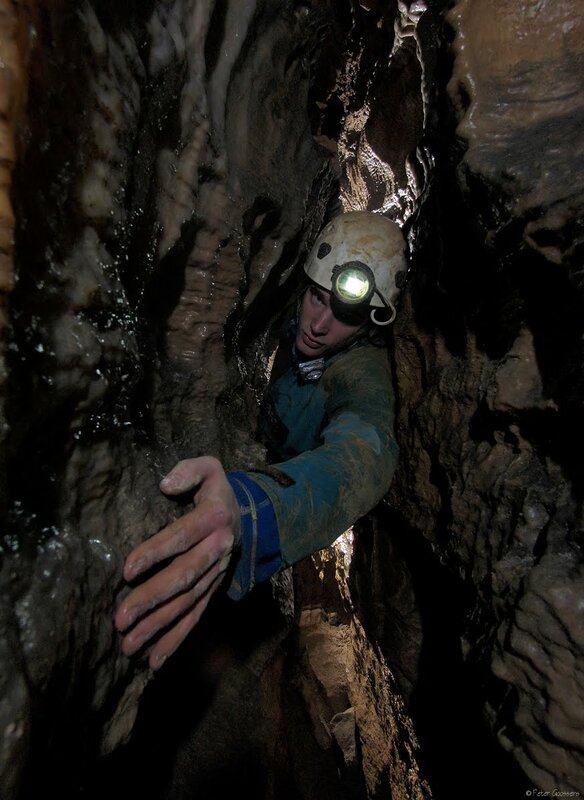 In elk geval voor herhaling vatbaar, zelfs als je de grotten inmiddels wel genoeg gezien hebt. 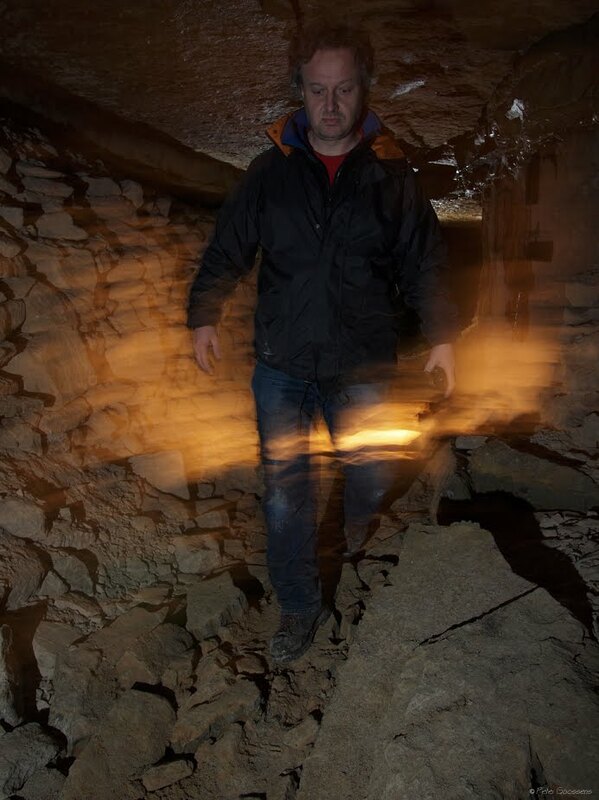 Je kunt er leuke en lange wandelingen in de groeve maken, fotograferen, gezellig bij mekaar hokken in het kamp. 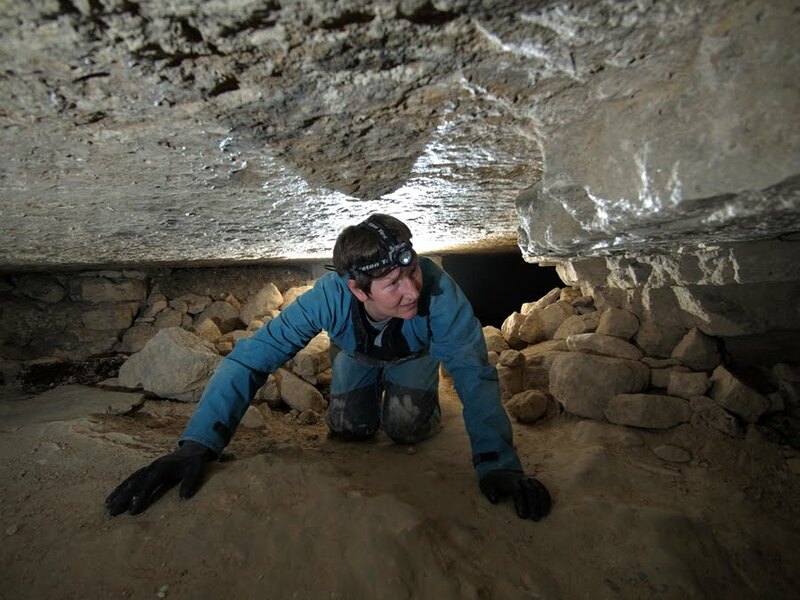 En buiten de mergelgroeve bevinden zich natuurlijk ook nog heel wat leuke grotten. In tegenstelling tot ons verblijf in de savonnieres in maart, toen met name Laurent het erg koud had in zowel het kamp als zijn zomerslaapzakje, en de rest zich gehuld had in ijslandtruien en donsjassen, hadden we nu een comfortabel knus kamp ingericht. Harold gaat komende Keigel een fotoserie presenteren van deze tocht! Gelukkig Nieuwjaar en de beste wensen voor 2012! Alweer een nieuw speleo jaar voor de deur met nieuwe uitdagingen. Onder het genot van een borrel willen wij samen komen op onze vaste plek Aux Arcades te Maastricht. 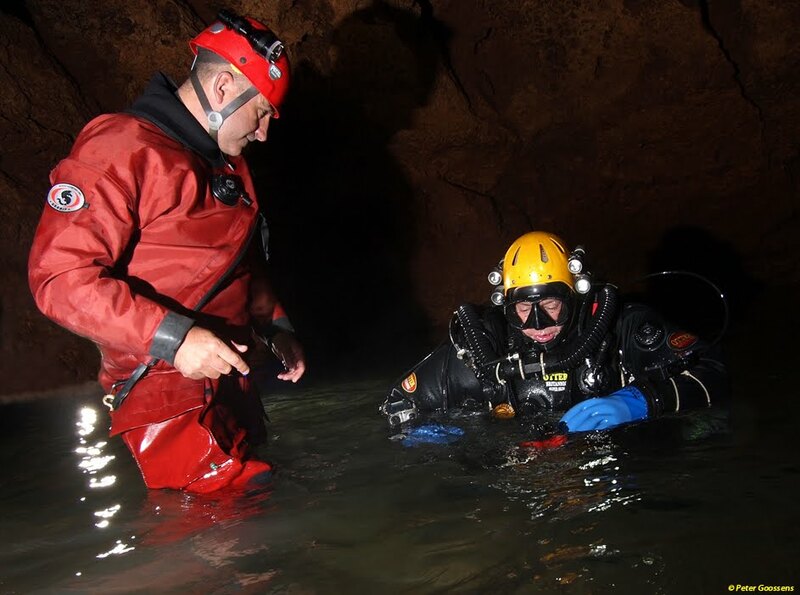 – Ruud Brasse zal hier een verslag doen van zijn Cuba Cave Dive Expedition! – Laurens zal een tussen verlag doen van een zeer geheime exploratie op Lanzarote. 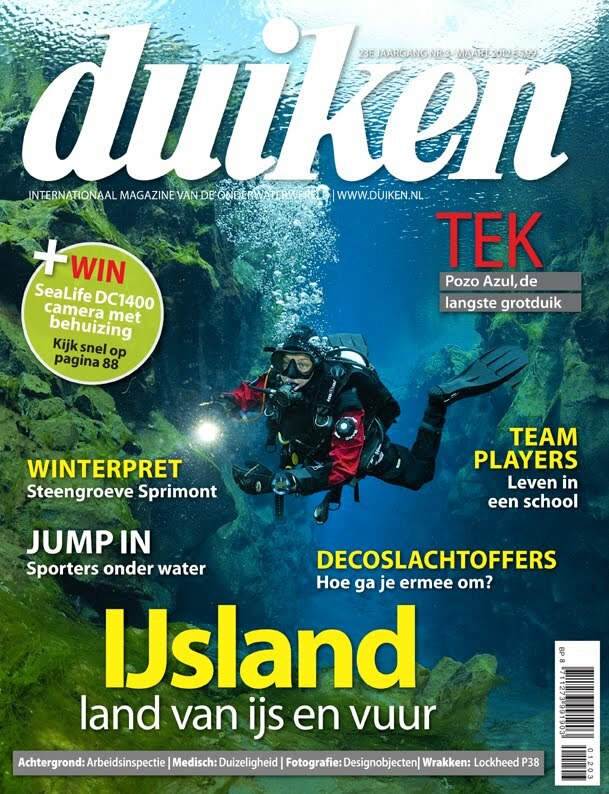 In de winkels ligt momenteel het nieuwe nummer van de National Geographic Magazine, met daarin een verhaal over de onwezenlijk lange duik van René Houben in de Pozo Azul! Zoals sommigen al weten, zijn Peter en ik afgelopen zomer op vakantie geweest in Spanje. 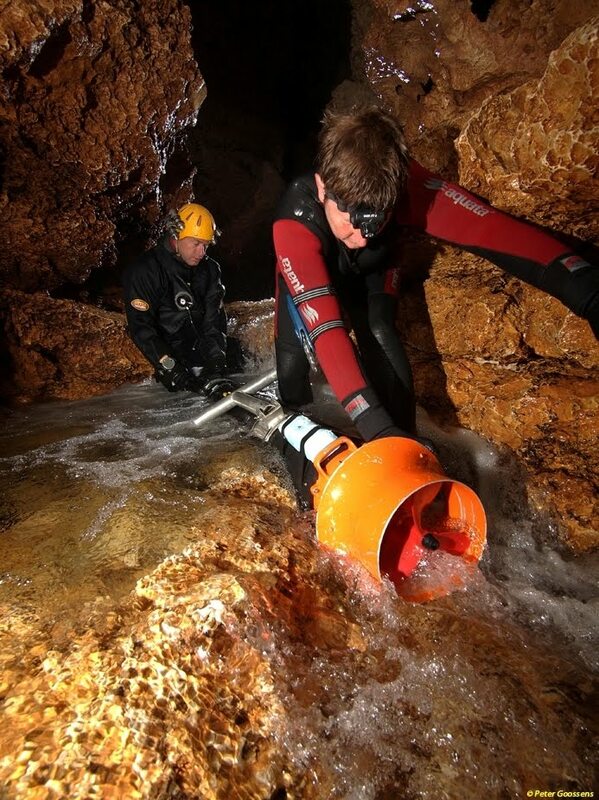 We hebben daar deelgenomen aan een duik expeditie in de Pozo Azul, een mooie onderwatergrot in het Noord Spaanse Covanera. 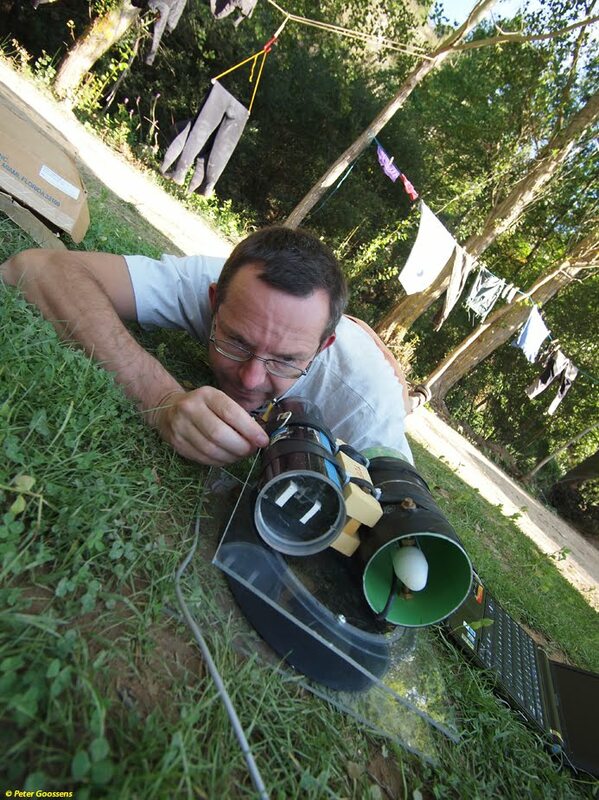 In eerste instantie was het onze bedoeling om clubgenoot en kameraad René Houben een weekje mee te helpen met zijn voorbereidingen voor deze expeditie. 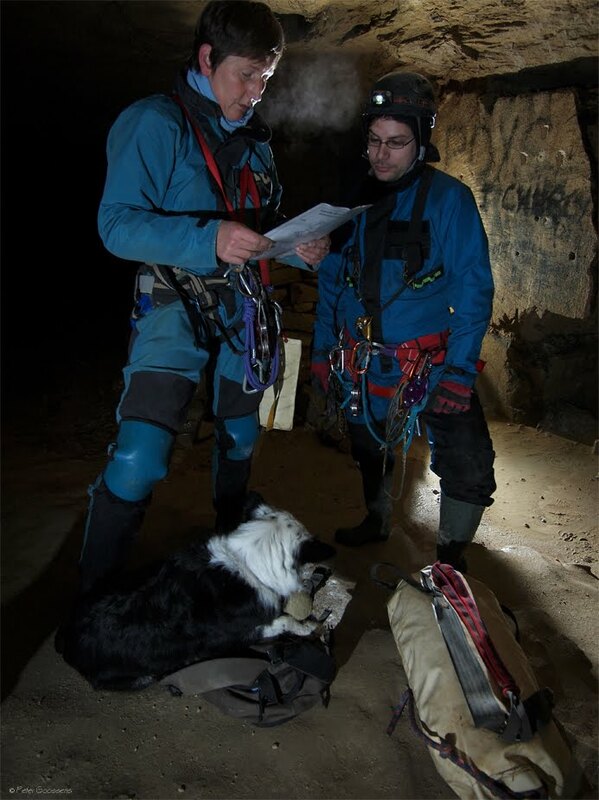 René neemt al jaren deel aan de exploratie van deze grot, samen met de Britten Jason Mallinson, Rick Stanton en John Volanthen. 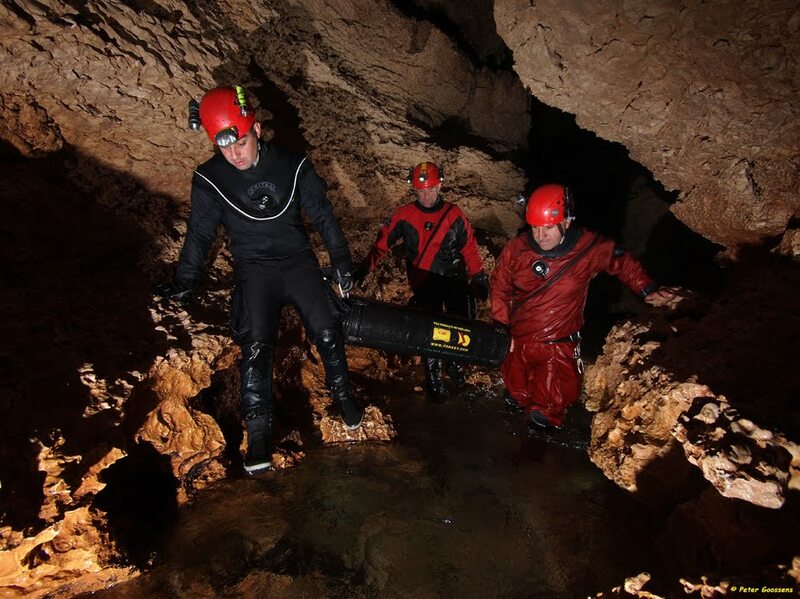 Deze 4 grotduikers vormen het team van exploratieduikers en zij worden elk jaar ondersteund door een grote groep Spaanse en Britse grotduikers. Ook een Nederlandse duiker maakte al enkele jaren deel uit van de groep support duikers. De expeditiegroep mag achter de bar in Covanera kamperen, in de verre omtrek is er ook geen camping te vinden. Daar het veldje achter die bar niet al te groot is, is lang geleden al besloten de expeditiegroep beperkt te houden en niet elk jaar nieuwe mensen toe te laten. 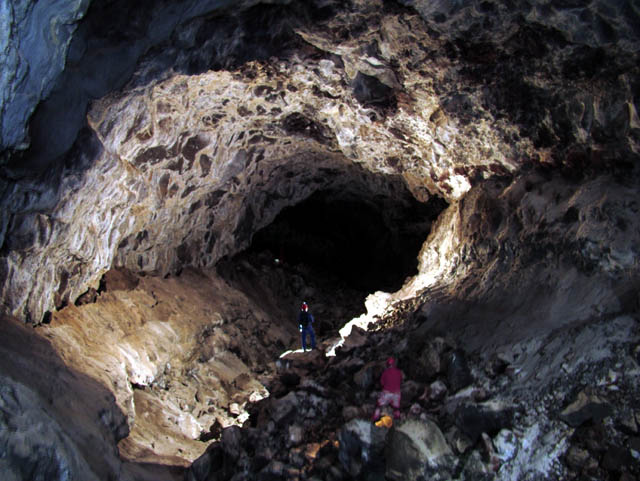 Dit was dan ook de reden waarom wij in eerste instantie alleen die eerste week zouden gaan en weer verder zouden trekken, zodra de Britten en Spanjaarden zouden arriveren. Het liep een beetje anders. 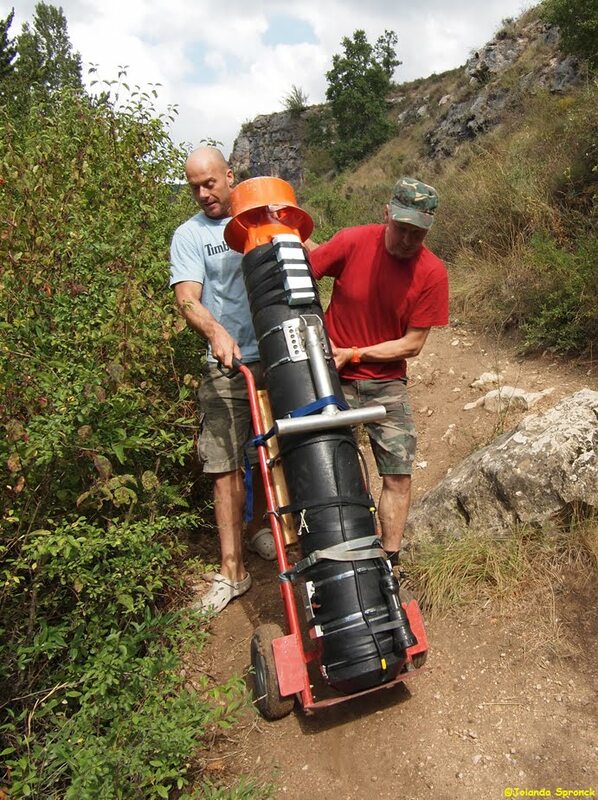 Er gingen heel wat voorbereidingen vooraf aan deze tocht, zo ontwikkelden René en Peter samen met nog iemand een nieuwe side mount rebreather en Peter maakte voor zichzelf een drytube (een drukbestendige en waterdichte container) om fotospullen droog mee door de sifon te nemen. Daarna volgden proefduiken omdat René natuurlijk moest oefenen met die net gebouwde rebreather en wij moesten oefenen met het scooteren, d.w.z. duiken met een onderwaterscooter. Uiteindelijk vertrokken we richting Covanera met de gedachte die eerste week nog verder te kunnen werken aan de voorbereidingen. Na een lange rit van bijna 1500 km, met onderweg nog een peugeot die het begaf en vervangen werd door een mazda, kwamen we aan in Covanera. Het was er lekker warm en de ingangspoel lonkte. Die eerste week waren we met z’n drieën, op enig moment vergezeld door Pollie (één van de Spaanse support duikers die eerder arriveerde). Er werd dagelijks gesleuteld aan scooters, rebreathers, flessen gevuld, uitrusting naar de grot gedragen en weer teruggedragen en op enig moment had ik de indruk dat we niet meer aan duiken toe zouden komen. 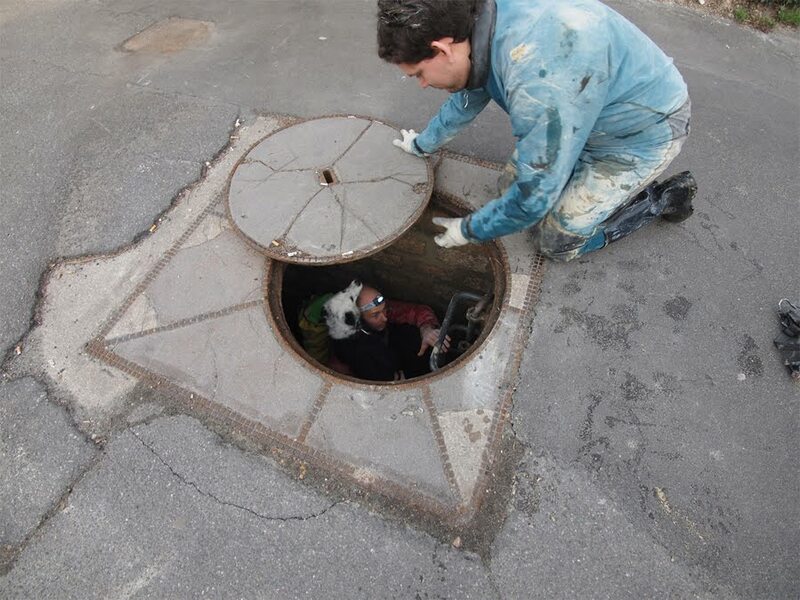 Ik besloot maar eens de stoute duikschoentjes aan te trekken en met een scooter alvast een beetje in de grot te gaan oefenen. Niet te ver, want het was voor mij de eerste keer in een grot met zo’n ding en de anderen stonden in de ingangspoel te sleutelen. Ik moet zeggen dat het me goed beviel! Maar gelukkig kwamen we toch ook nog aan duiken toe! Tussendoor hebben we in alle rust al wat fototochten kunnen maken en René kon één van de habitats al klaar maken voor gebruik. Een habitat is een omgekeerde container die ervoor zorgt dat je na een duik je laatste lange decompressiestop op een wat comfortabeler manier kunt volbrengen, n.l. door deels uit het water op een bankje te zitten. Op vrijdag druppelden de eerste Spanjaarden en Britten binnen. Peter en ik besloten toen onze tent op te pakken en elders (wild) te gaan kamperen. We wilden toch nog een paar dagen langer blijven om nog wat te fotograferen en René kon ook nog wat hulp gebruiken. Ook dat liep weer een beetje anders, we kregen n.l. bezoek van de guardia civil die ons vriendelijk doch beslist verzocht onze spullen in te pakken en te vertrekken. Expeditieleider Jason besloot dat er achter de bar nog plek over was en nodigde ons uit weer gewoon in het kamp te komen kamperen. Eind goed, al goed, we zijn er uiteindelijk nog een 2e week gebleven waarbij we alle voorbereidingen voor de “push”, de exploratieduik, hebben meegemaakt en eraan mee hebben kunnen helpen. Het doel was ditmaal de limiet van vorig jaar te bereiken en vandaar uit verder te exploreren. Jason hoopte een nieuwe droge galerij te vinden en vanaf de oppervlakte zouden mensen proberen met elektronica het huidige bivak in Tipperary te lokaliseren. Hiervoor zouden een baken en een ontvanger gebruikt worden. Het baken ging met de duikers de grot in en de ontvanger zou aan de oppervlakte meegaan. Als het baken eenmaal in Tipperary geïnstalleerd zou zijn, zouden de duikers middels een 15-tal signalen berichten kunnen doorgeven. Je moet daarbij denken aan: “we zijn allemaal veilig gearriveerd”, “de eerste exploratieduiker vertrekt”, “we komen terug” etc. Jason zelf ondervond jammer genoeg wat problemen omdat zijn eerder op 200 meter neergelegde drytube vol gelopen was. Hierin zaten al zijn spullen die hij nodig had in het bivak, zoals slaapzak, eten etc, maar ook allerlei reserve materiaal. Het was nu onbruikbaar geworden en hij moest zijn duik vroegtijdig afbreken. Dit betekende ook dat er niets gelokaliseerd kon worden vanaf de oppervlakte, daar hij een deel van het baken in zijn drytube had. René dook als eerste vanaf het bivak en vond na 260 meter nieuwe grot een 3e droge galerij, later Razor passage genoemd. Deze galerij bleek wel een obstakel omdat hij met diverse cascades stevig omhoog voerde met vlijmscherpe uitsteeksels die een gevaar voor het droogpak vormden. De grot gaat daarachter weliswaar verder met een nieuwe 4e sifon, maar ditmaal was het voor de duikers onmogelijk om hun loodzware en tegelijk zeer gevoelige duikapparatuur over Razor passage te krijgen. De groep zal dus terug moeten komen om verder te exploreren en een manier moeten bedenken hoe dit te doen. Momenteel meet de grot ruim 9,6 km waarvan 9,1 km onderwater! Het drietal heeft de nieuwe galerij getopografeerd en is terug naar het bivak gedoken, om van daar uit na nog een nachtje slapen weer de lange terugtocht naar buiten te maken. Overigens wordt ook tijdens het duiken onderwater getopografeerd. John heeft hiervoor een zogenaamde “lazy boys sump mapper” op zijn scooter bevestigd die tijdens de duik peilingen uitvoert en afstand meet. Eenmaal buiten worden de gegevens via een computer gelezen en in een topo verwerkt. Wat Peter en mij betreft. We duiken weliswaar regelmatig maar dergelijke lange en diepe duiken zijn voor ons niet weggelegd. Je moet dit allereerst ook wel wìllen, en er vervolgens ook nog de benodigde apparatuur voor hebben… Dat laatste is een dure aangelegenheid. 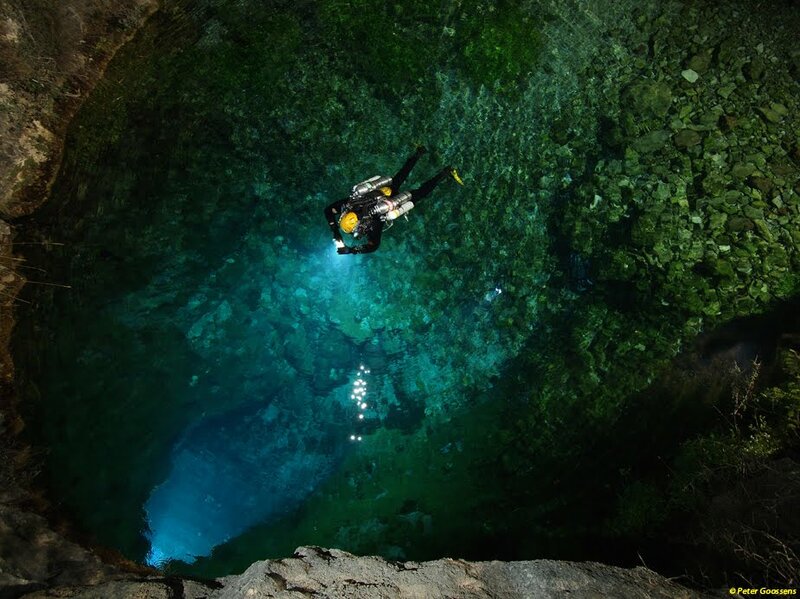 Wij waren al meer dan tevreden dat we in de eerste sifon hebben gedoken (700 meter onderwater, dan nog een eindje met een laag lucht erboven). We hebben met name René geholpen met het transporteren van materiaal over de droge galerij Burbuja. En we zijn ook nog een klein stuk in de 2e sifon gedoken om foto’s te kunnen maken van de helemaal opgetuigde duikers die een lange duik gingen maken, of van duikers die de habitats gingen inrichten. Het scooteren door de immens grote gangen was een geweldige ervaring! En de groep Britten en Spanjaarden was leuk om te leren kennen. Wellicht komt er een vervolg…. Met speciale dank aan Ernst Vonk van Vonk b.v., die ons voorzien heeft van een aantal duiklampen van Peli.